For one who is intimidated by color, at least color in the home, I really would like to try something new. I love the daring colors that friends boldly splash around their homes yet when it comes to my home, I retreat rapidly. I just love the incredible change to the room on page 15, even though it's a little cluttered for my taste. I love the crisp, clean, and fresh look of stark white (see page 35) which you can constantly change with bright (or pastel) cushions or accessories. However, I also like bold colors and even certain florals on the odd occasion. My three favorite rooms in the book are the calm sitting room which is uncluttered and peaceful on page 62, the bedroom on page 65, and the other bedroom on page 67. 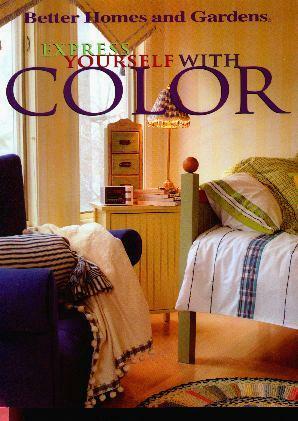 This is an extremely helpful book when it comes to changing the color of a room (ask anyone who has been through it, just how confusing it gets) which we all feel like doing from time to time. There are great questions, hints and tips, and helpful advice to consider before going ahead and transforming your home. Even though this book is about six years old, good style never becomes dated. Some colors are more "in" at different times than others, but great ideas can be garnered from many decorating or color books, despite their age. The best thing about painting is that if you don't like it you can just paint over it - no big deal. Hopefully you decide to repaint before you get more than one wall done. Conclusion - Very practical and useful.